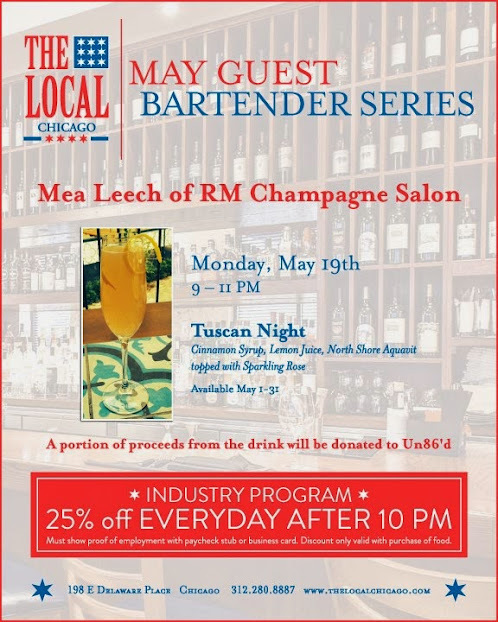 The Local Chicago is proud to announce the next guest bartending event with Mea Leech of RM Champagne Salon on Monday, May 19. From nine to 11 pm., Mea will be serving her signature cocktail, Tuscan Night, for $13. The drink features Cinnamon Syrup, Lemon Juice, North Shore Aquavit topped with Sparkling Rosé. In addition to the event, the Tuscan Night cocktail will be available for the entire month of May at The Local Chicago and a portion of the proceeds will be donated to Mea’s charity of choice, Un86’d. Un86’d is Chicago-based charity created to aid in monetary relief for restaurant professionals in need, including educating workers on how to utilize public and private health for their own benefit. The organization strives to support an industry that is often overlooked. The Local Chicago also reminds members of the service industry including those who work at restaurants, hotels, spas, and gyms of their 25% off discount available every day after 10 p.m. Guests must show a business card or pay stub to take advantage of this offer. WHEN: Monday, May 19th from 9 – 11 p.m.
Monday – Sunday: 6:30 a.m. – 2 a.m.
After opening Chicago Cut Steakhouse in September 2010, restaurant industry veterans David Flom and Matt Moore set their eyes on Chicago’s Gold Coast and opened the doors to The Local Chicago. Intended to be an everyday eatery for the Gold Coast Crowd, the restaurant is a comfortable tavern-esque restaurant with an American theme and hearty homestyle favorites like meatloaf made with USDA Prime beef, rotisserie chicken pot pie, salmon Reuben sandwiches and other original twists on classics. The Local Chicago is open from breakfast through late-night dinner. The Local Chicago is proud to announce the next guest bartending event with Paul Sauter of Mercadito on Monday, April 14. From nine to 11 pm., Paul will be serving his drink, You Make Me Bomba, for $13. The drink features Brudal Extra Dry Rum, Ginger Syrup, Lemon Juice, Cucumber Puree, Yacateca and Mint. In addition to the event, The You Make Me Bomba will be available for the entire month of April and a portion of the proceeds will be donated to Paul’s charity of choice, Un86’d. The Local also reminds members of the service industry including those who work at restaurants or hotels, spas, and gyms of their 25% off discount available every day after 10 p.m. Guests must show a business card or pay stub to take advantage of this offer. WHEN: Monday, April 14, 9 – 11 p.m. The Local Chicago is proud to announce the next guest bartending event with Paul Bastien of Drumbar on Monday, March 10. From nine to 11 p.m., Paul will be serving up his drink, The Highway Man, for $13. This drink features Apple Brandy, Averna Amaro, Lemon, Raspberry Simple Syrup, Creole Bitters and Peychaud Bitters, garnished with cinnamon. A portion of sales from the cocktail will be donated to Paul’s charity of choice, Big Shoulders Fund Chicago. Big Shoulders Chicago provides support to Catholic schools in the neediest areas of inner-city Chicago. 100% of funds currently raised by the organization go toward programs that benefit Big Shoulders Fund schools and the students they serve by providing scholarships, special education programs, instructional equipment, much-needed school facility improvements, faculty support, operating grants and more. Over the past 25 years the Big Shoulders Fund has raised over $215 million. Following the event, Drumbar will host an afterparty from 11 p.m. to 1 a.m. HOURS OF OPERATION: Monday – Sunday: 6:30 a.m. – 2 a.m.
After opening Chicago Cut Steakhouse in September 2010, restaurant industry veterans David Flom and Matt Moore set their eyes on Chicago’s Gold Coast and opened the doors to The Local. Intended to be an everyday eatery for the Gold Coast Crowd, the restaurant is a comfortable tavern-esque restaurant with an American theme and hearty homestyle favorites like meatloaf made with USDA Prime beef, rotisserie chicken pot pie, salmon Reuben sandwiches and other original twists on classics. The Local Chicago is open from breakfast through late-night dinner. This March, Chicago Cut Steakhouse and The Local Chicago will celebrate Chicago’s 177th anniversary with specials featuring the city’s most savored dishes since its incorporation in 1837. Chicago Cut’s signature Bone-In Rib Eye, slightly charred on the outside with a warm and red center, dry-aged and butchered on site, will be available at both restaurants for $54. Additionally, the restaurants have teamed up with Black Dog Gelato to create a Cracker Jack Gelato Sundae for $10 as a nod to Chicago’s favorite snack. “The success of our steakhouse is, in large part, due to Chicago’s long-standing commitment to quality food,” said owner David Flom. “Our service is a reflection of the city’s rich history and we look forward to making this celebratory day special for Chicagoans.” Since opening in the fall of 2010, Chicago Cut Steakhouse has become a staple in the Chicago restaurant scene and a favorite for locals and visitors. The restaurant has played host to a number of well-known athletes, celebrities, and politicians from Chicago and around the country. The special dishes will be available on the city’s anniversary, Tuesday, March 4 at both locations. In addition, they will distribute the iconic Chicago flag pins worn by all of their servers. Monday – Friday: 7 a.m. – 2 a.m. Restaurant industry veterans David Flom and Matt Moore opened the doors to Chicago Cut Steakhouse in September 2010. Situated along the historical Chicago River and serving only the finest cuisine, Chicago Cut Steakhouse truly redefines the traditional steakhouse experience. It is the only steakhouse in the city to exclusively serve USDA-certified prime steaks, which are butchered and dry aged on the premises. Serving breakfast, brunch, lunch and dinner and offering private dining options, the restaurant features a dramatic dining room, vibrant bar area and sprawling outdoor patio. Additionally, the owners have introduced an iPad wine list, which offers guests a wine selecting experience unrivaled by their peers. With 40 iPads providing video, images and detailed information about each wine and their origins, Chicago Cut Steakhouse ensures a memorable and unique dining experience at every level. In April 2012, Chicago Cut Steakhouse was featured as one of America’s Top Ten Steakhouses in USA TODAY. Most recently, Yahoo named the restaurant one of the Top Five Steakhouses in America. The Local Chicago is proud to announce a new beverage program with a selection of cocktails. In addition to the development of new drinks for the in-house menu, the restaurant and bar has also teamed up with mixologists from Drum Bar, J. Parker, Mercadito, Three Dots and a Dash, American Junkie, Perennial Virant, Drawing Room, RM Champagne Salon, LUXBAR and more to kick-off their industry program. “Our brand is committed to honoring all that is local and we wanted to include cocktails from some of the city’s best mixologists,” says managing partner at The Local, David Flom. Each month, a different drink will be featured from local mixologists on The Local’s cocktail menu. One dollar from each cocktail sale will benefit the charity of the mixologists’ choice. The program will kick off on Monday, December 2, with an event featuring all the cocktails. These drinks will not be available again until their delegated month. Full and photos menu available upon request. This football season, The Local introduces a special package perfect for watching the game at home or heading to Solider Field to cheer on the Monsters of the Midway. The best comfort food in the city is perfect to feed your group without the mess of a barbecue. Each package feeds up to four people. To place an order, guests can contact The Local Chicago at 312.280.8887. Home delivery is also available. Photos available upon request.